I just have a very quick card for you today. No plan for this except that I wanted to use the paper crimper which I haven't had for very long. As for the colour scheme...I actually love Chocolate Chip and Kiwi Kiss together and find it hard to move away from when using my Trendy Tree's stamp set. I hope you like today's card. * Trendy Tree's Stamp Set. 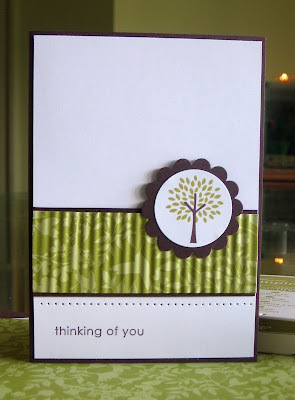 * Kiwi Kiss, Chocolate Chip and Whisper White Cardstock. Urban Garden DSP. * Paper Crimper, 1/3/8" Circle Punch, Scallop Punch, Stampin Dimensionals, Mat Pack & SAMJ. Well done on another gorgeous card. Isn't the crimper great? The crimping is the perfect touch. Hope things are going well Nerine.